Building a OTS Supermarine Walrus. Thread: Building a OTS Supermarine Walrus. Here is my progress for today. Unpacking and assessing where parts go. With gunners hatches open or closed and with wheels down or retracted and rudder down in place of the tail wheel. I opted to go with gunners hatches open. The only drawback was I had to supply my own gunners. Ignoring the written instructions I filed out the slot in the tail and glued the tail into place. Next I assembled the Radial engine whilst waiting for the glue on the tail to go off. Then drilled out the engine center and added the prop. The drilling out of the holes for struts. the attachment of the wheels and struts with a little adjustment for the fact that they were only supplied in the down position. By this evening I had reached this stage. Engine pod glued to lower body, with long legs under the engine. Upper wing positioned and glued to engine pod. Note temp rods to keep wings in alignment. The four remaining wing struts cut to length allowing for protrusion below the wing which will house the floats. Struts glued in place, and the whole left to dry for the morrow. This morning up early and got a bit more done. Floats fitted angled slightly upwards towards the back. Glued in rudder holding in place with tweezers. Rudder in place. Next job drilling hole for peg and magnetic swivel. now getting ready for visit from Cpt Kiwi. 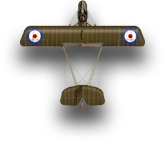 This evening I have done a bit more work on the aircraft. Drilled out for the swivel ball. Fine drill first, and then opening up until the ball is about one third inside the body. Note small ball glued into body but Bomber magnet on the peg. This works far better on all metal aircraft. Now a light undercoat of white primer. Allow to harden overnight and tomorrow the painting can begin in earnest. Today I have been mostly painting. A master class in construction. Thanks Rob. Beautiful work, Rob. Thanks for sharing! I don't think I could handle all those fiddly bits. A seaplane in desert camo seems a bit odd, but the model looks terrific. Wonderful Rob! I am looking for 5 color schemes, now I have 4, thanks. Rob that was fantastic to see from start to finish. I have not done any of the metal models I will have to work my way up to them. Excellent walk through on how to assemble and paint a plane to a high standard. I know you didn't need to do this here but when you drill through the Wings and push through the struts how do you cut them off flush with the wing, do you test fit, cut to length and then glue or do you fit, glue and then cut to length, if the later how do you get the protruding stub flush? The glue Zap A Gap, is this a super glue style quick set glue with gap filling properties. I've been using super glue to hold struts in place and then building up the joint with a semi quick setting araldite epoxy but I get quite an unsightly joint. Very much like the cockpit canopy, it's come out really well. Top marks Rob, what a superb model. A fair bit of test fitting and the use of a needle file until they are just below the surface. A dab of different coloured paint on each ensures that they go in the correct hole in the rush of gluing up. It is a Super glue with gap filling qualities. Comes at three setting speeds. I just squeeze a little onto a cocktail stick and apply very sparingly. I was amazed myself. It is the first time I have had an aircraft with decal canopy. I would certainly use one again. Saves a lot of faffing with multiple colours, shades and dry brush work to say nothing of getting the glazing bars thin enough with a brush or pen. Used a lot in Egypt, but this one is for Malta. Cheers Rob Thanks for the info.